1. If not pre-rinsed, rinse quinoa in fine sieve under cold running water. In medium saucepan, bring to a boil with 1-1/2 cups/375 mL water. Reduce heat to medium; cover and simmer until water is absorbed, about 12 minutes. Fluff with fork. Let stand covered for 15 minutes. 2. Meanwhile, in small bowl, mix cucumber with salt; let stand for 20 minutes. In separate bowl, soak onion in cold water for 20 minutes. Rinse cucumber under cold running water; drain onion. 3. For dressing, in small bowl, whisk together lemon juice, oil, vinegar, mint, hot sauce, salt and pepper. 4. 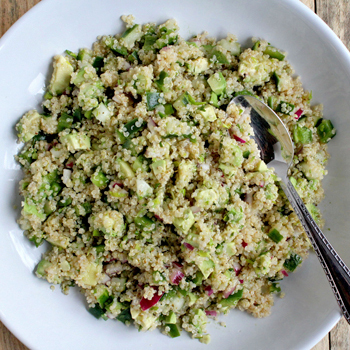 In large bowl, combine quinoa, cucumber, onion, avocados, green pepper and parsley. Mix well with dressing.